F. Scott Fitzgerald’s description of a superb intellect applies to rst-rate internal audit functions that maintain an optimal balance between their assurance and consulting work. On the one hand, CAEs who shared insights on how to maintain this balance are resolute that assurance services and the internal audit function’s unwavering devotion to independence come rst. Yet auditing leaders emphasize that exibility is crucial in adding strategic value to their organizations via client services that extend beyond their traditional assurance work. According to the results of the 2015 CBOK Stakeholder Study (www.theiia.org/CBOK), internal audit’s stakeholders want internal audit to provide advisory work where it does not interfere with its assurance work. Areas beyond assurance cited most frequently by respondents to our study – who included a broad range of C-level executives along with board members – include consulting on business process improvements, facilitating and monitoring effective risk management, alerting management to emerging issues and changing scenarios, identifying known and emerging risk areas, and identifying risk management frameworks and practices. 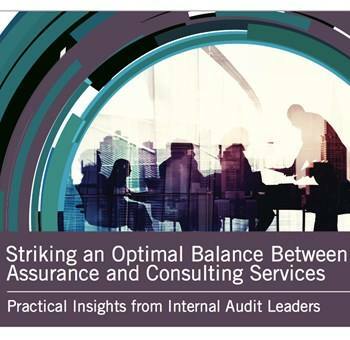 To be clear, all of the CAEs who shared their insights on leading practices for balancing assurance and consulting work describe an ironclad commitment to maintaining their function’s objectivity and prioritizing internal audit’s assurance services over all other activities. They deploy processes and tactics to ensure these table-stakes assurance and independence requirements are adhered to, monitored, resourced appropriately, and communicated to the audit committee. These CAEs also have in place a collection of interesting practices to select, deploy, monitor, and report on consulting services, which may comprise anywhere from 7 percent to 40 percent of an internal audit function’s time and resources. In most cases, CAEs report that their assurance-consulting work breakdowns range from 80/20 to 75/25.